SIX PEOPLE WERE convicted today of being members of a banned terrorist group in the UK. A jury at Birmingham Crown Court found two men and a woman guilty of belonging to the extreme right-wing neo-Nazi group National Action, after another three admitted guilt before the trial. In the case of Thomas and Patatas, they gave their child the middle name Adolf in honour of the Nazi leader, the Guardian reported. Thomas was also found guilty of having a terrorist “manual” on his laptop that gave advice on homemade explosives including a “soft drink can bomb”. All six were arrested on 3 January, and charged on 8 January, with being concerned in the commission, preparation and instigation of acts of terrorism. The court heard that the group would use various means to hide their contact with each other, including pseudonyms through encrypted messaging platforms. They also met in person to spread their ideology. The prosecution built its case around texts and images shared on messaging apps. The messages praised the Nazis, Hitler, the “final solution” and images that included that of men dressed in paramilitary style clothes holding up or surrounded by National Action banners. Detective chief superintendent Matt Ward said the individuals involved were “not simply racist fantasists” but a “dangerous, well-structured organisation”. “Their aim was to spread neo-Nazi ideology by provoking a race war in the UK and they had spent years acquiring the skills to carry this out,” he said. They had researched how to make explosives. They had gathered weapons. They had a clear structure to radicalise others. Unchecked they would have inspired violence and spread hatred and fear across the West Midlands. Ward said the convictions had dealt a serious blow to National Action but that doesn’t mean the threat they posed had gone away. Comments are closed as those involved have not yet been sentenced. 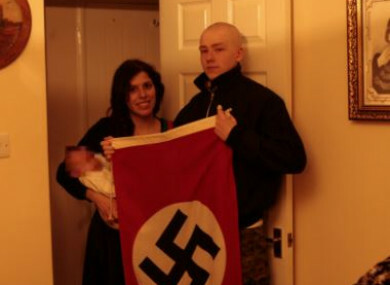 Email “UK couple who named child after Hitler among six convicted of being members of neo-Nazi group”. Feedback on “UK couple who named child after Hitler among six convicted of being members of neo-Nazi group”.